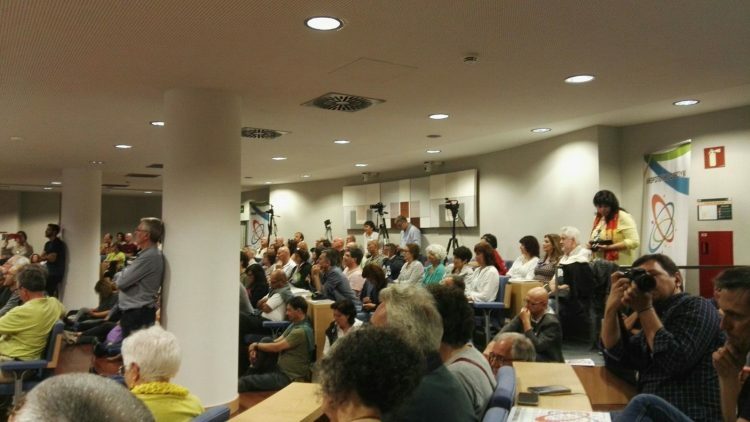 On the 11th of May, the opening session of the 5th European Humanist Forum took place. 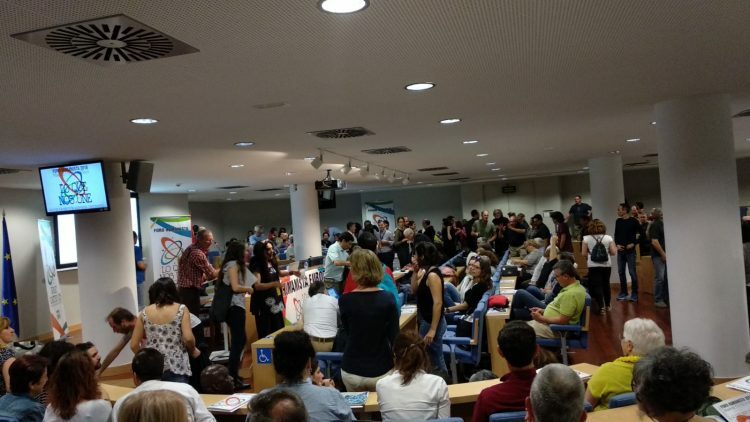 It was held in the UNED Faculty of Education Sciences in the presence of people and organisations from 40 countries, mostly Europeans, but also Asians, Africans and Americans. Hello and welcome to this 5th European Humanist Forum. Welcome to all those friends who have come from other continents, and to those who have come from across Europe; from Austria, Belgium, Cyprus, Czech Republic, Denmark, Finland, France, Germany, Greece, Hungary, Iceland, Ireland, Italy, Netherlands, Portugal, Switzerland and the United Kingdom, and of course to all of you who have come from all over our host country, Spain! The current known today as Universalist Humanism was founded by Silo in Argentina in 1969. At that time there was a military dictatorship which opposed the nonviolent current that Silo preached, and so they banned him from the cities and told him “if you want to speak, go and speak to the stones.” And so he gave a speech that today is known as the “Healing of Suffering” in front of a few hundred followers and the international media. In this speech, Silo spoke about the difference between pain and suffering, the origins of suffering and how to overcome it. He also spoke about the different forms of violence, highlighting the relationship between internal violence and human suffering. Over the course of 40 years of intense dedication, Silo developed a body of doctrine and practices of considerable scope, particularly relevant in this historical crossroads at which we find ourselves today. Even though Silo died in 2010, his work continues inspiring the efforts of many people. We will not be able to achieve any social or institutional change, if we don’t also make an internal change, in our heads and our hearts. A change of purpose and direction in our lives seems to us to be a priority in order to modify human processes. On the basis of this, the working areas of the forum, besides entering into the details relevant to their areas, will surely have to investigate the more profound conditions that determine our behaviour. But let’s not delay with things already said in the Manifesto and in the programme! We have the great pleasure to leave you with Professor Tiberio Feliz, who will proceed to officially open the Forum on behalf of the Rector of UNED. After these greetings, the evening moved on to three panels coordinated by Pressenza editors which served as a small entrée for what the Forum wanted to show and build in the coming days. In the first, there was an analysis with a planetary look of what unites us towards the Universal Human Nation. Coordinated by Tony Robinson, reflections came from Guillermo Sullings regarding his interpretation of the Universal Human Nation – a concept first talked about by Silo – and how we can get there; Judge Baltasar Garzón spoke about Universal Jurisdiction; Nicole Ndongala – President of the Karibu Association – gave us a first person account of migration; and Dr. Carlos Umaña from Costa Rica and member of the anti-nuclear organisations ICAN and IPPNW warned about the dangers of a nuclear conflict in this historical moment. This was followed by a projection of the Universal Human Nation from a more European perspective. The interventions dealt with Europe’s role in uniting its peoples and in building bridges with other regions and peoples on the planet. 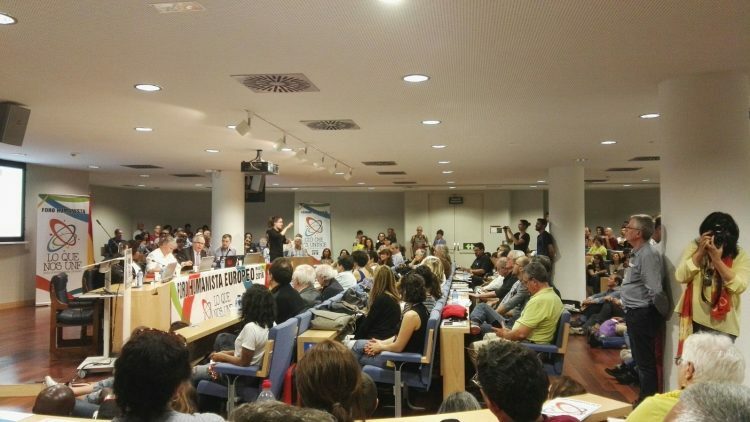 In this case, Ricardo Arias moderated the interchange with the speakers; Sabine Rubin, Siloist and French politician for France Insoumise; economist and political scientist Riccardo Petrella who called for rebellion, and the neuroscientist, Piero Giorgi, who affirmed that human nature is nonviolent. The last panel centred on “A New Culture for a New World”, seeking to find the elements, the indispensable pillars on which to build the Universal Human Nation. Coordinated by Juana Perez, this was a panel of women with their feet on the ground, the result of their experience as social activists. All of them agreed that this world we aspire to isn’t something in the future; it’s already here and being built now. 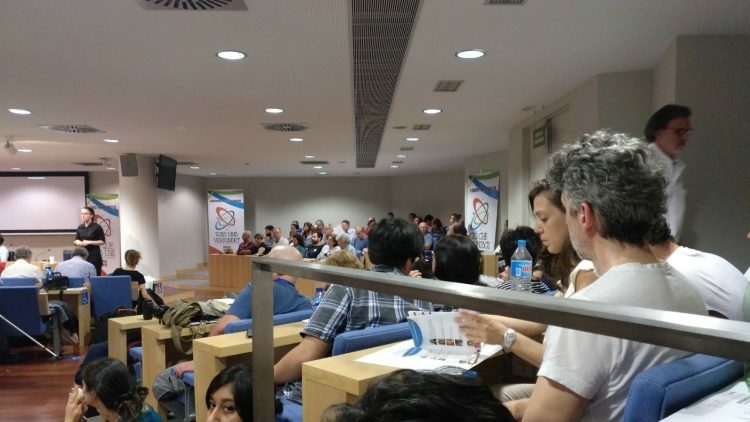 It is present when environments of direct democracy are being created in her country – as pointed out by Greek journalist and Pressenza editor, Marianella Kloka; in the economic projects that have been set up and which respond to a new, collaborative – not competitive – social model spoken about by Mayte Quintanilla from Humanists for the Universal Basic Income; and in the convergence of cultures experienced by young people who find themselves obliged to migrate due to lack of employment, but also enriched through the experience of meeting people from different places as emphasised by the young anthropologist Clara Gómez-Plácito. The evening finished with poetic verses in different languages accompanied by Nadège Gattoni on the guitar. Here are some photos taken by the people in the audience with their phones.